Does anyone have some practical experience drilling stainless steel? I'm trying to put a pin in the handle of a knife project, and getting a hole in the blade tang is defying me. I can't recall ever having to drill stainless before, and it's giving me fits. Any tips, or tricks would be appreciated. Carbide bits, oil and a drill press and go slow. Thats the only way I've ever been able to drill through stainless steel. I've heard that using a punch with the tip ground into a diamond shape (pyramid) will make a dimple the bit can grab, but I don't have a nail set I want to sacrifice just yet. I have a set of these that have drilled everything I've encountered so far. They'll fly through an old file like it was balsa wood. Unfortunately I don't have the size I need. I picked the size pin I wanted to match a HSS bit I had. Now I have 1/2 the handle drilled in the larger size. If I can get a hole through the steel with the Rodman bit, I guess I can still pin it, and fill the gaps on one side with something (epoxy, Gorilla glue?). I'm going for functionality, not a professional look in the end. By a couple high dollar bits from the big box retailer. You might burn a couple of them up. I have found it easier to drill pilot holes and work my way up to the final size. For a punch you can sacrifice a 16d nail. With a good whack it will give you a couple grooves to bite on. Can you drill a smaller pilot hole with the Rodman bit, then chase it with the larger bit you used on the handle? That's my first plan now. If I get the pilot hole drilled, I can probably enlarge it with what I have. A buddy is bringing me some cutting oil this afternoon. Buckskin: I had a flash in my mind of using a 16d nail, but wasn't sure it would be hard enough to dent the stainless. I'll give that a try first, before grinding up an otherwise good punch. The Rodman bit should do the job. Here's their "resume". They are only sold through trade fairs where they can be demonstrated. The company doesn't want them just hanging is some store along with all the other products. A 5-piece set was $25 in 1974. I have no idea what they cost these days, but they ain't cheap! The company has been making cutting tools since 1928. Your bits should work then. Smack it with a nail. Drill the pilot and work your way up. Maybe a little cutting oil along the way and you should be fine. Just for chuckles, to check current value, I searched eBay. The ONLY Rodman product offered is a 12" hacksaw blade. I guess nobody who owns Rodman drill bits wants to part with them. Hahaha! You could try spot annealing the place you want to dril with a pencil torch. Gunsmiths use this method when drilling a hardened receiver for scope mounts. Wrap the rest of the blade with wet rags so it doesnt overheat, and direct your flame at the spot you want to drill. As long as the blade doesnt overheat it cant hurt to try. I was unable to drill a Gerber stainless blade with conventional bits and ended up using a dremel with a small grindstone to enlarge existing holes. Like WB said, carbide bits with oil and patience should work. I'd tend to agree with PW. Either soften the spot on the steel or use a high speed diamond bit (tile bit or something). I've drilled hardened stainless before, but it's no fun and will burn up bits. If you do decide to use drill bits, use lots of cutting lube and go REALLY slow (you probably know this already). I've found that the TiNi blades aren't worth the money, and will never get through hardened steel. Carbide MAYBE, but you may be better off spot-softening the steel. Like WB said, carbide bits with oil and patiemce should work. Thanks for that tip. All I have is a conventional BernzOmatic torch that covers a lot of area. BTW, the idea of the 16d nail was quite humorous in application. I now have a nail that looks the same on both ends! And the stainless blade was not amused. where on the blade/tang are you drilling? A soft handle is no problem, and if your hole is going far from the cutting edge, you could simply invert the blade in a cup of cold water and torch the exposed tang. The water will keep the blade cool (adding ice and salt would help, and since stainless shouldn't be a problem for just a couple minutes). Here is my problem. This is from my "favorite chopper fail" thread. All the attempts to epoxy/glue have failed, so it's time to pin the antler to the blade. you can see have have virtually nothing to work with. Hahaha! Now, if I had some potatoes, carrots, an onion and some beef cubes to that bowl, I can eat dinner when I'm done with the blade. OP, do you have a flat bed scanner? I am curious about the dimensions of that blade. If you could scan it and then print out a sheet, draw in the handle and then scan again it would give me a good idea of the size. It might be pretty easy to make a close copy from a circular saw blade if the knife isn't too big. A saw blade would be hard already and only need a couple of holes drilled in the tang, but it would be easier to implement there because you'd have more material to work with so annealing wouldn't pose problems. And, it would be a lot stronger than trying to hang a handle on 3/4" of tang stub. I'd have to compare the two, but it would probably fit across a 10" saw blade. At this point, I'm not really interested in starting from scratch. 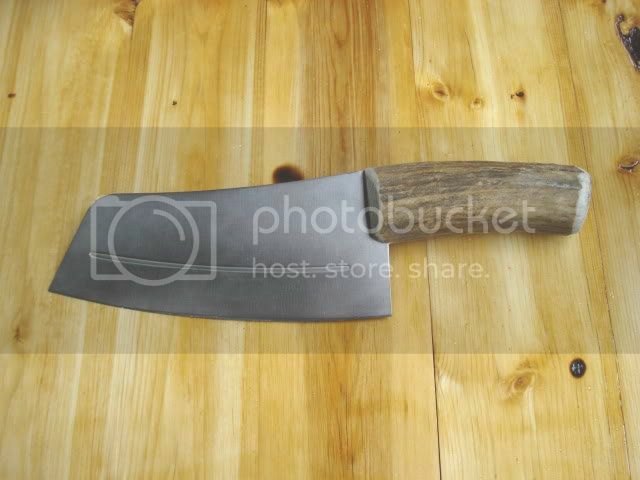 I like this blade because it's very thin, and I can use it as a scooper/scraper when I'm chopping stuff. When I get ready to try to duplicate it with a homemade version, I have 2 x 35 foot lumber mill bandsaw material begging to be used. The only adjustment I need to make to this project is to get a pin through there what will take some of the stress of torque when using the knife. It's not like I'm going to be chopping wood with it. The glue jobs have held for many uses, but eventually fail. If I just get one pin in there, it will take the strain off the glue joints. If I can even get the 1/16" hole drilled with the Rodman, I might even epoxy in a chunk of bailing wire cross-wise to the blade to anchor it in the slot I cut. I think you're on the right track, Ol' P . It shouldn't take much for a bit of 'mechanical' fit to hold everything in place. The adhesive alone, just ain't enough. I did much the same thing on one of my mother's favorite kitchen knives one time. Good tip on the offset hole. Hehehe.... I knew I could get you to post if I mentioned "bailing wire". Well, I thought there was chance you might get a dimple with the nail. I am wondering now if a fluted masonry nail would have the stones to do it....? The last time I had to go through hardened metal I burnt out 2 different drill bits and used oil and the slowest speed on my drill press. I got halfway through and decided to use my Dremel and a grinding stone. It took seconds to go through. I ended up making the hole slightly bigger than I wanted but in my project it didn't matter. I have an engraving bit for my Dremel. Since two of you now have had success that way, I may try that if I can get that little pilot hole drilled. I'm getting on it in just a few minutes, so we'll see. Well... I got delayed, but I got the handle on the blade. You pro and semi-pro knife makers will either shake your head, laugh your butts off, or just puke...but it's on there. The Rodman bits cut that stainless like it was butter! The pilot hole went through without even smoking, with a drop of cutting oil for good measure. I ended up drilling a slightly larger hole with another Rodman bit. Because of the short tang, and the slot I had to cut in the antler, even after it was pinned it had some slop to it. I filled the voids with Gorilla Glue so it would expand and fill them. The idea was to keep the short tang from rocking back and forth with the pin as a pivot point. The GG expanded as expected and the thing is rock solid now. Just a quick pic to share. I haven't cleaned up the residue, or the peening job on the pin yet. BTW, the pin is a piece of brass braising rod. Looks good! I hope it lasts you at least as long as it did with the original handle. I think it's on there for good, now. I should have pinned it in the first place, like I was advised. Gaaah... really? I hate that monkey squirt glue. Hubby fixed a few of my knives and the dishwasher's heat just let them loose again. And it bubbles.. spreads as it bubbles.. ( he tried to fix a cupboard door and a recliner with that crap) I have a passionate dislike for that stuff... :S I would have voted for the epoxy.. I would have also suggested the dremel. I drilled some holes through a SS bowl with the ruby stone bur I had that came with the kit. As for your knife OP.. I think its really cool. I can see it being a very useful chopper and scrapper. I'm just learning to use a clever I found last summer for chopping at canning time. I like it. 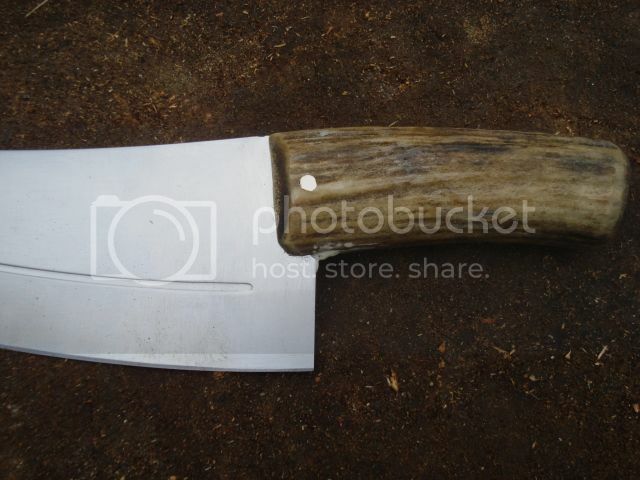 I like the looks of the deer antler handle. The original Gorilla Glue (which I used) is supposed to be waterproof, which it is. However...it's not heat proof, nor is it freeze proof. I'm very selective where I use it, and you have to take into account the expansion. In this case, that's exactly what I needed. I've used it outdoors on wood projects and was very disappointed. Sun softens it, and below zero temperatures makes it brittle. Now the gorilla tape... oh boy.. that stuff is completely dangerous. Took off one of my eyebrows with that stuff. ROFL! I remember your adventure with the heat ducts. Gaaah... really? I hate that monkey squirt glue. Hubby fixed a few of my knives and the dishwasher's heat just let them loose again. There lies your problem.....didn't anybody ever tell you to NEVER put your cutlery in a dishwasher? I like Gorilla glue but don't like the fact that if you open an $8.00 bottle of it, use 25 cents worth and not need it for a couple of months you have a bottle of hard glue. Nice job on that cleaver OP, I remember the post about it sometime ago. The new GG bottles are much improved. There is a rod in the cap that keeps the neck clear, and the bottles (at least the small ones) are better designed to squeeze all the air out between uses. That is good to know. I only buy them little bottle now but haven't for awhile. I like to keep some around just in case I need it. I wish they would package it in little single use foil tubes like you can buy with superglue. I sorry for bump an old topic I just have a few interesting observations from personal experience, maybe someone will need this information in the future.Stainless is already pretty hard and as it heats up it will work-harden even more. Hal has it right, go to a real industrial/machine supply house and buy some good quality HSS/Carbide twisted drill bits. If this is a one-time thing then don't bother getting coated bits. The coating is primarily to help the longevity of the bit, not really to ease or help the drilling process itself. If you plan to use this drill a lot then an AlTiN coating works good on extremely hard metals (steels, stainless, high-carbon, etc). I would probably use a 1/8, then 1/4, then 3/8, then 1/2" to get the desired hole. You could also stop at 3/8 if you wanted to use the punch listed earlier in this thread. The smaller bits you can spin faster (200-ish RPM's), then slow down as you drill bigger (100-ish RPM's). Trick here is to limit the linear speed of the cutting surfaces so as to not work-harden the stainless (overheat). Ask the supply house for a drilling fluid that isn't runny and put a quarter-sized blob over the cutting area. When one bit drills through it, change the bit then wipe the new bit down with cutting fluid using a rag. If the steel scarf (shavings) start to turn blue as you are drilling then you are going too fast and should slow down. The stainless you are drilling is thin and will heat up quickly if you aren't careful. If you do blue the stainless then stop, let everything cool down (bit included), re-oil, and SLOWLY drill past the blue. The last thing I want to mention is to not break these bits https://mechanicguides.com/best-cobalt-drill-bit-sets/ while drilling. Unlike the cheaper bits these do not flex. What they will do instead is shatter if you use too much force or dont hold the drill steady. It has been my experience that the cobalt coated bits you linked to will not drill through hardened steel. Just out of curiosity, because it looks like this project has been completed in a very satisfactory manner, would it have been possible to have welded a longer tang out of softer metal onto the existing tang? And then shaped and pinned a handle on, in a conventional manner? I know most people don't have the fancy (ie. expensive) welders but we have local welding shops that would do a small job like that for just a few dollars. Just asking because I don't know. Maybe the hardened SS won't weld. It gets to brittle. Melts like butter when heated to welding temps. Was to thin. There must be reason this was not put on the table as a solution, but I don't know why. Could someone enlighten me? As the instigator of this debacle, I may be able to enlighten you. It was a $3.00 knife. A trip to the welding shop would have been an estimated $20, if I was lucky. If I might illustrate my "fix it or forget it" philosophy with another recent example. I spent $12 on a flip-top water bottle. Within a month the rubber thingy that acted as a spring to pop open the drinking spigot snapped. I could 1) forget the one handed operation of the pop-open valve, or 2) throw it out and go spend another $12+ on a new bottle. Option 3 was to find an O-ring at the hardware store, drive out the pivot pin, and replace the cheap rubber band with the neoprene 0-ring. Cost of repairs: $0.30. Sense of satisfaction: Priceless. Aha, Now I see. 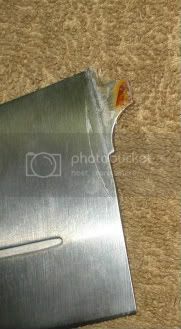 I thought this was a blade you had formed from raw material and spent many, many hours in its construction, only to have the tang break off after an exuberant round of chopping. I know where your coming from in the personal satisfaction category. I love fixing things others say can't be fixed. Farmers use GPS to steer their tractors down a field. Makes for less overlap or missed areas, hence less wasted seed, fertilizer, time, etc. "There's no repair, a new one is $149.00." I stocked the ends. I charged $7.50 + tax for the end, it took me 5 minutes to crimp it on so I charged $5.00 for labor (I thought $60.00 an hour was more than fair) and the customer was out the door for $13.00. Me and the customer both got a personal satisfaction out of fixing something that "couldn't be fixed".